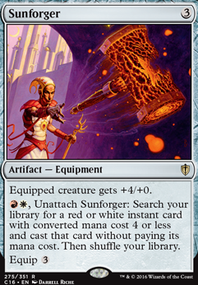 I think you missed the point--my point was that Tana, the Bloodsower would be your Voltron engine. In addition to Trample, which is all-important on a Voltron commander, Tana produces chump blockers. One of Voltron's biggest problems is the focus on a single creature leaves you wide open to an enemy's attack, and also leaves you with next-to nothing should your creature be removed. Tana alleviates those problems some. 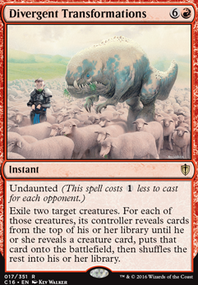 Bruse Tarl, Boorish Herder provides benefits to Tana by giving her double strike at least once (ETB effect) and likely twice (ETB and attack on the next turn). 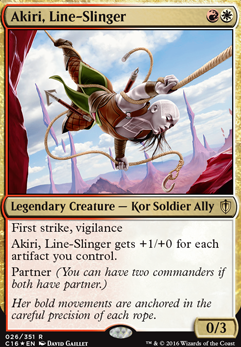 Akiri, Line-Slinger is only useful insofar as she is the Voltron component, and provides no substantial benefit if Tana is your core creature. 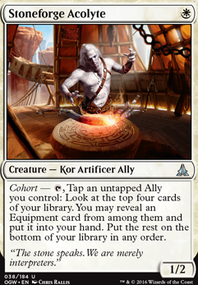 As I mentioned in my prior post, I think Bruse Tarl, Boorish Herder would be better than Akiri, Line-Slinger for what you're trying to do. 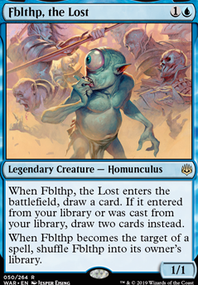 I will try to get to your other non-Vorthos questions when I can, though I might not be able to for some time. BUMP THE ERASING PANDORICA, & WHY CAN'T THE SONIC SCREWDRIVER AFFECT WOOD EVEN WITH SHEFFIELD STEEL?! Just updated the OP. I'll ask AlwaysSleepy one more time for the Doomsday pile; as I now realize, the Exile Zone thing is just asking too much. 3/5 cards in the pile are already shown. Though I wonder if anyone wanted to help w/ the other Deck still in the works of being Cut & Revised (The Deck). Also, Who to choose alongside Tana, the Bloodsower ? Akiri, Line-Slinger , or Bruse Tarl, Boorish Herder ? From there, I'll start the Equip-Voltron Project. That said, I'm almost complete w/ the Tetzimoc, Primal Death , deck, & I'm liking it. But what to do w/ all other things mentioned earlier? Any ideas? 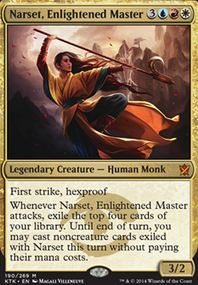 There are a number of possible Naya Voltron commanders, but I think your best bet is going to be Tana, the Bloodsower and Akiri, Line-Slinger would make a good commander. 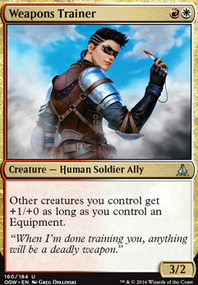 Partner is a weird choice for Voltron, as each commander tracks its damage separately, but I think these two might be uniquely situated for what you want, and they allow you to adjust your strategy depending on who you are playing against. Tana, the Bloodsower is great against enemy decks with creatures, as you're getting chump blockers every single time you deal damage with your commander. She also has trample to punch through some additional damage. 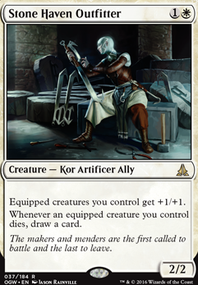 If you are using Tana, the Bloodsower as your Voltron in a given match, Akiri, Line-Slinger still makes for a pretty nifty little card, as she will be getting boosted by the equipment attached to Tana. 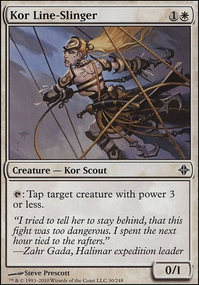 If you are against players with fewer creatures, you could use Akiri, Line-Slinger for her ability to become an ever-increasing threat. 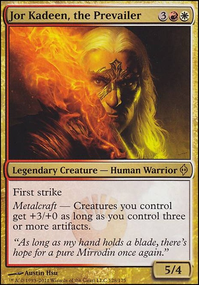 Najeela, the Blade-Blossom is a good alternate commander, she's pretty cute. 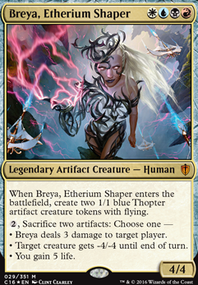 Akroan Skyguard , Akiri, Line-Slinger , Bruse Tarl, Boorish Herder , Sun Titan , Swords to Plowshares , Mother of Runes (the eternal masters version), Damia, Sage of Stone , Jace, Cunning Castaway . Fist of Suns could be altered to have Thanos' handsome self on it. There was a shirtless men tribal deck that got a lot of attention, so you could check there for some inspiration. On another note I am planning on building a new deck but I am a bit lost on which next deck I want to build. It's going to be a 75% build meant to go against new players as all my other decks apparently are too oppressive or too fluid to bring against newbs. 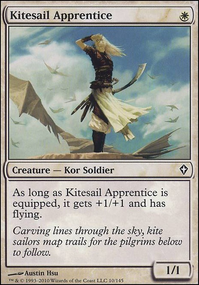 So here is what I been thinking should I build a Akiri, Line-Slinger / Tymna the Weaver partners Aikido/Sunforger control build, Vorosh, the Hunter hyper aggro build, or rebuild my Bear tribal deck now with Goreclaw, Terror of Qal Sisma instead of Yeva, Nature's Herald at the helm. I'm also open to suggestions, but I'm less inclined to use popular commanders at my LGS or commanders my meta already has. Thanks in advance! ZendikariWol on Favorite Voltron Commander and why? I actually LOVE playing Zurgo as a political piece. My fav voltron is kinda tough to say, but Tana, the Bloodsower with Sidar Kondo of Jamuraa or Akiri, Line-Slinger or Bruse Tarl, Boorish Herder or Silas Renn, Seeker Adept , all good partner combos. But honestly? The slot for my favorite voltron commander, if only it were legendary, is easily Cephalid Constable . 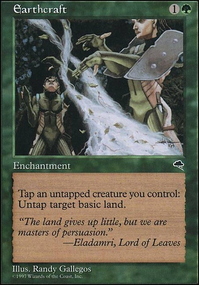 This desperately underrated card should, in my opinion, appear in any voltron deck that can run it. 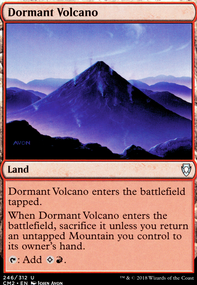 I have ended so many games with this card and a good ol' Aether Tunnel . Throw some pump enchantments on that baby and watch 'em all concede.